Clifton Branch 139, Mcneil Road Railway Hall Institute. *Prizes for semi finalists and finalists. 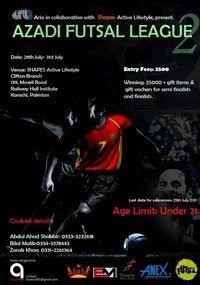 *One week free gym facilities at SHAPES Active LifeStyle for player of the tournament. Forms will be available online, at SHAPES, with all the organizers and at Cafe Mazeh (Khadda Market). Squads: Teams can have a minimum of 6 and a maximum of 9 players. of teams have been finalized. Refreshment and Food stalls will be available at the venue. Water will be available for the players. Shapes is the largest chain of "Health and Fitness Clubs' in Pakistan. With branches all over Pakistani, the facilities they offer are without doubt top of the line! Their vison being to empower "people with renewed energy and active lifestyle." from the managment of Shapes. Their help has assisted us increasing the standard we set last year. Anex is known for it electronics, and specializes in home appliances. They believed in us last year and were not let down and God willing will not be let down this year either.